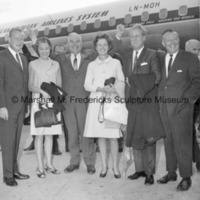 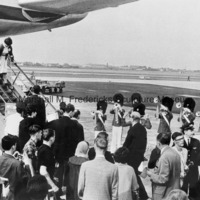 An unidentified woman, Urban Hansen, Rosalind Fredericks, Marshall Fredericks and two unidentified men following the landing of the plane carrying DIADEM participants. 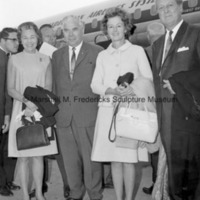 Urban Hansen and his wife with Marshall and Rosalind Fredericks following the landing of the plane carrying DIADEM participants. 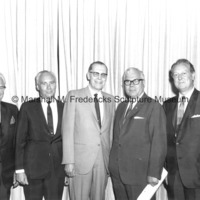 Consul Gerard Edsburg, Tommie Thomsen, Lord Mayor Urban Hansen and Marshall Fredericks at the presentation of The President's Committee on Employment of the Handicapped Award by Detroit Mayor Jerome Cavanagh to Marshall Fredericks in September 1967. 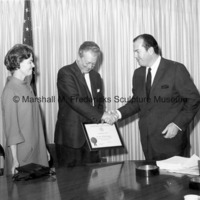 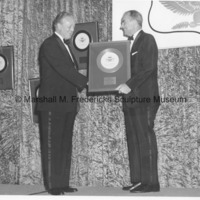 Marshall Fredericks is presented with The President's Committee on Employment of the Handicapped Award by Detroit Mayor Jerome Cavanagh in September 1967 as Rosalind Fredericks looks on. 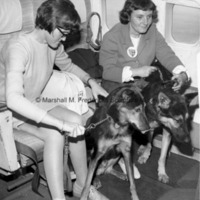 D.B.M.C. 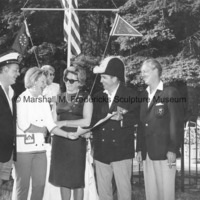 Twenty Year Anniversary hosted by Ches. 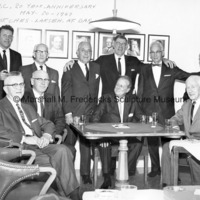 Larsen at the Detroit Athletic Club on May 20, 1967. 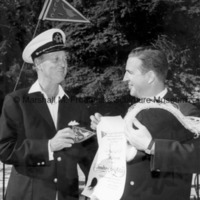 Marshall Fredericks installed as Commodore of the Farrelli Flotilla by the Quarton Lake Yacht Club on June 16, 1966.